He rode the prairies and, for a time, ruled the plains. Frank. and his brother Jesse James, were some of the biggest names of their times. 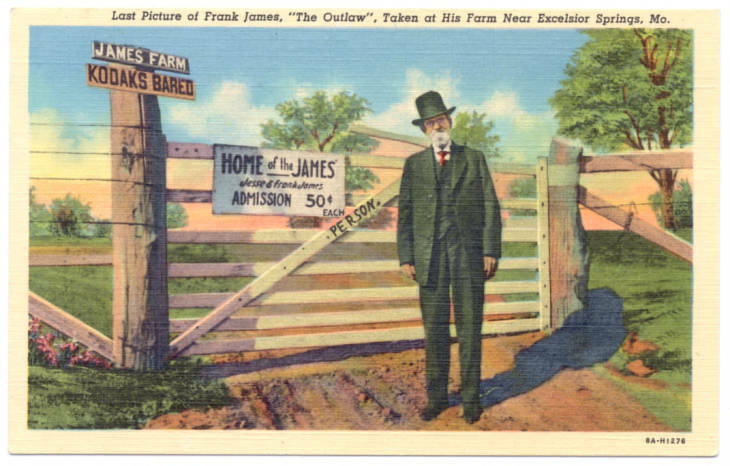 I’ll bet Frank James never thought he would wind up selling 50 cent tours of the James Home. Frank probably didn’t expect to wind up like this. Americans have a unique vision of themselves and their role in the world. Unlike perhaps any other peoples in history, Americans see themselves as people of destiny and a people who were put here to do something phenomenal and something significant for history and for all peoples of the earth. This unique self-concept, sometimes perceived as arrogance, is deeply grounded in a set of archetypes that Americans use to form their vision of themselves in the world. And no other archetype is as powerful in the American psyche than that of the cowboy. The actual American cowboy was indeed a unique individual. While probably not as noble and ruggedly handsome as the images created of him in the movies, they were unique types of men who carved out a civilization from the rugged wilderness that was the American west in the years before the turn of the last century. Some of the reasons that the image of the cowboy sometimes includes elements of the outlaw and the loner is that much of the legend of the cowboy came from stories of refugees from the broken southern army who took to the life of the cowboy rather than attempt to integrate into a society that included making peace with “the Yankee”. And that type of individual certainly did account for many of the outlaws who went on to become the stuff of legend and stories even to this day. The renegade and loner image combined with the rough life of an actual cowboy whose job it was to guide those huge herds of cattle along trails such as the historic Cumberland trail where they could be sold to become the steaks, leather and other goods that were sold in rustic American stores of the time. This was a difficult life and the stories of the trail make up many history books for sure. But far more of the stories of the trail are glorifications of that lifestyle that must have been difficult indeed. But the image of the cowboy was also something that grew larger than what the actual lifestyle of those simple but rugged men must have lived in the American west. It was an image that pulled together heroes as far flung as the Australian Gaucho cowboy, the Japanese Samurai and a knight in King Arthur’s court. It was an image of a man who demonstrated the rugged individualism that all Americans consider to be one of the central unifying traits that makes America great. The cowboy image is one that even has its influence as high in the social strata of America that it influences the presidency. It is said that there is a tradition for any president when he first is elected and comes to Washington to begin learning this big new job. Tradition h olds that each president has as part of their early duties to sit down and watch the movie High Noon. They say that President Clinton watched it dozens of times in his early years. If this is true, it accounts for how often a new president seems to grow and change in the office and becomes his own version of the great American hero that is depicted in that movie. The American cowboy defends the virtue of the weak and helpless. He is a staunch defender of families and those in society who are trying to carve out a home in a difficult world. As such, the American cowboy fits with the “superhero” image that also appeals to the American system of justice and morality and values. Even the star wars epic films were fundamentally grounded in the legend of the cowboy. The cowboy concept grew up from a history of our country that included the settling of a big land and the settling of a wilderness that pit the god given will and intellect of man against God’s creation. And it was the will of man that prevailed. That is why American’s admire the cowboy because he represents their own struggles for greatness, for success and to be a heroic figure at least for their families, home towns and churches. And that desire so deeply rooted in the culture of American history will always be what makes America and Americans great. Bill Markley, author of Deadwood Dead Men and Dakota Epic: Experiences of a Reenactor During the Filming of Dances With Wolves. Chris Enss, author of Thunder Over The Prairie: The True Story of a Murder and a Manhunt by the Greatest Posse of All Time and More Tales Behind the Tombstones: More Deaths and Burials of the West’s Most Nefarious Outlaws, Notorious Women, and Celebrated Lawmen will tell exciting tales of the Old West. Authors will give a presentation and be signing their books.